We all like a good bargain, especially in the increasingly competitive and outrageously priced world of football transfers. That is why we have come up with a list of Football Manager 2018 bargains – players that won’t break the bank but are still capable of playing for a top-flight side. Cheap not good enough? 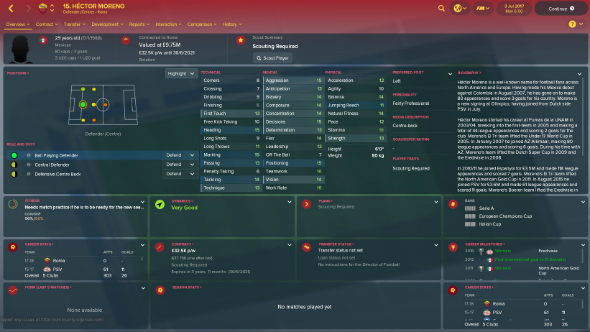 Here is a list of Football Manager 2018 free agents. 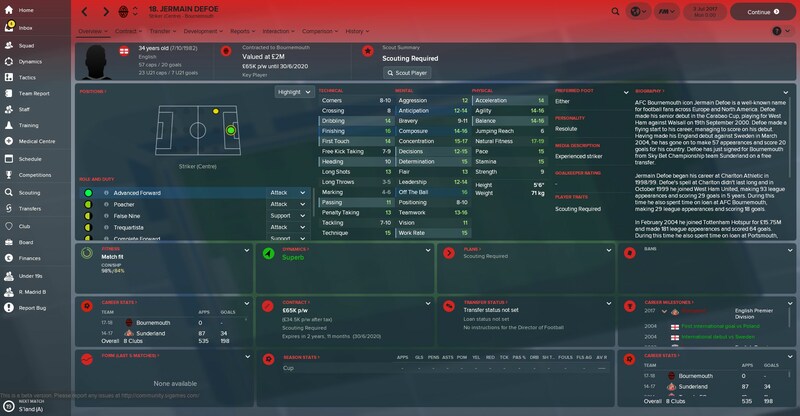 You can read our Football Manager 2018 review here. 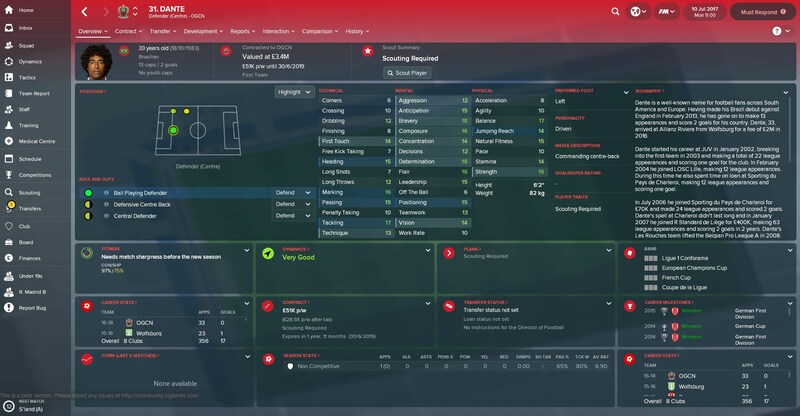 Our list of the best Football Manager cheap players around consists of 11 players that offer a variety of qualities both on and off the ball. Some of them are veterans who still have something to give but are being passed on by their parent club to make way for new blood, whilst others are the new blood that are more valuable than they seem. The remainder have simply gone under the radar or have been rejected due to injury concerns. 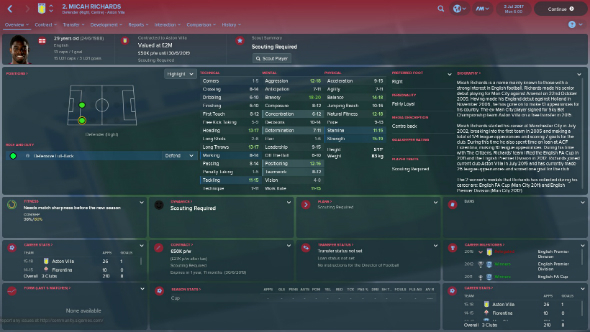 For our money, the Football Manager 2018 bargains listed here are worth any associated risks. It always pays to have a goalkeeper of genuine experience in your squad, whether that is to actually take up a position between the sticks, or to mentor youngsters. 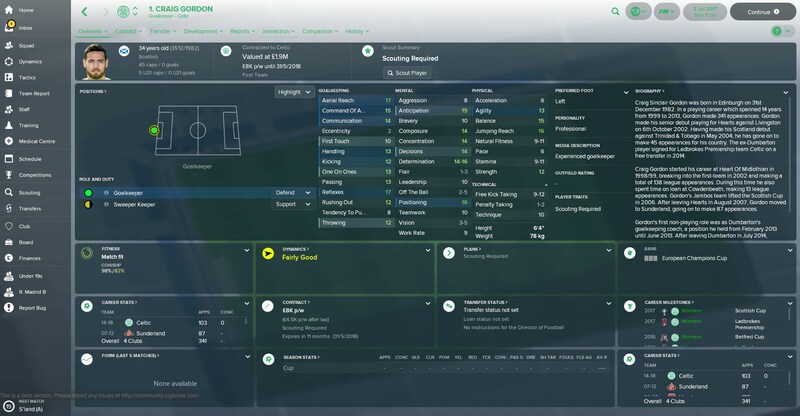 For less than £3 million, Craig Gordon is one of the best Football Manager 2018 bargains around – valuable as both a positive dressing room presence and a player to be called upon for games. 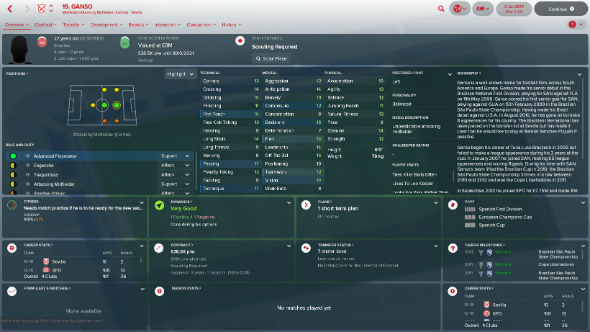 He is good enough to select as your number one for a team at the bottom of a top league, or to come in as backup to an up-and-comer such as Jordan Pickford at Everton, Nick Pope at Burnley, or even Geronimo Rulli at Real Sociedad. In the scramble for European clubs to poach the best talent from South America, some players are inevitably missed. Nicolas Tagliafico, a left-footer more than capable of playing the modern, high-intensity fullback role, is one of those. 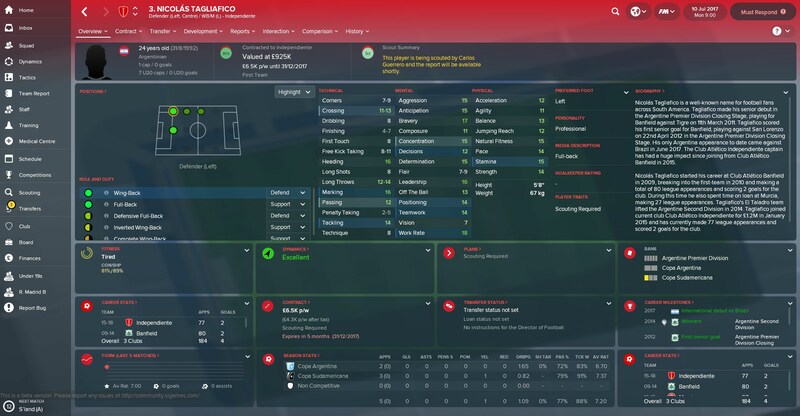 He is not lightning fast, but he has enough pace to not get caught out so long as you define his role properly – like all FM18 bargains, you will have to present Tagliafico with sensible instructions to get the most from him. As an added bonus, his stats for work rate, concentration, and leadership means he rarely makes mistakes and demands the same from his team-mates. 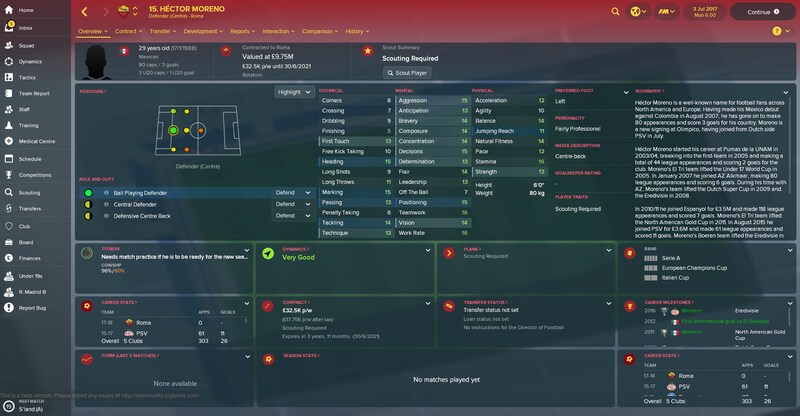 His fee might not be what you would expect to see in a list of Football Manager 2018 cheap players, but given some of the prices demanded for other centre backs you are getting a lot for your money with Hector Moreno. He was fantastic at PSV and more than deserved his move to Roma with the Mexican excelling in stamina, marking, and heading. Perhaps more importantly, though, his mental attributes are fantastic across the board, making him a positive and influential presence in the squad. 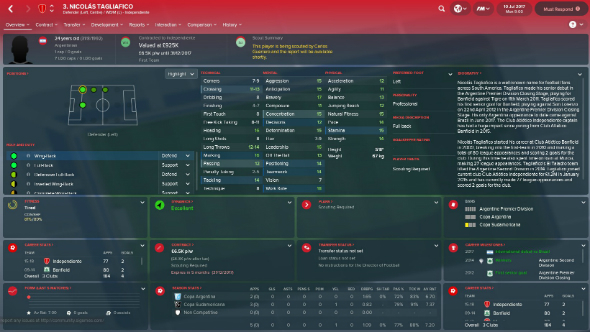 Like Moreno, Dante is available at a very reasonable price given his talent and experience. His mental attributes are remarkable, scoring best in determination, bravery, composure, and positioning is all vital for a centre back – and his strength and balance are equally as impressive. 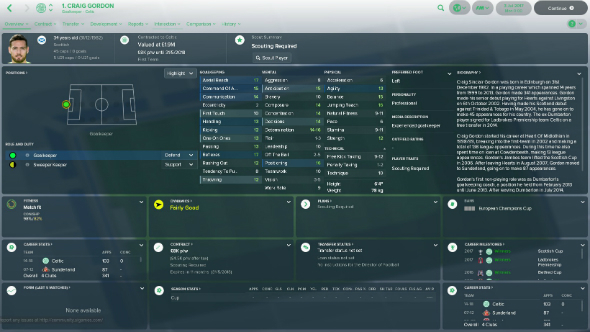 He is not quick, though, so only consider making a move for him if you are planning on playing a deep defensive line or if you have already got a fast player to partner with him. Given that he has been at both Man City and Fiorentina, you could well argue that Micah Richards has had enough chances to make it at the top – but for £2 million you will not find many Football Manager 2018 bargains with ten years under their belt at a club like Man City. The main issue with his game is not necessarily a lack of ability; it is more a lack of modernity. He has more in common with the playing style of Lee Dixon than that of Marcelo or Jordi Alba, but if you prefer a conservative approach to defending then Richards can help provide structure at the back. Not long ago, Ganso was being touted as the next Brazilian to strike it big in Europe and put his mark on the world of football. Alas, continued problems with his knees and cruciate ligaments stunted his development, which means he has been only a bit-part player at Sevilla since joining the La Liga side in 2016. Still, he retains the technical ability that got everyone so excited about him in the first place, and if you can fit him into a team that already has midfielders prepared to do the bulk of the running for him then he can play a huge part in future success. 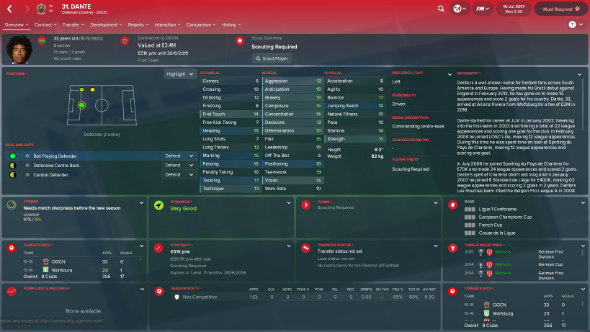 Think of him like the Football Manager 2018 cheap players equivalent of Nwankwo Kanu. 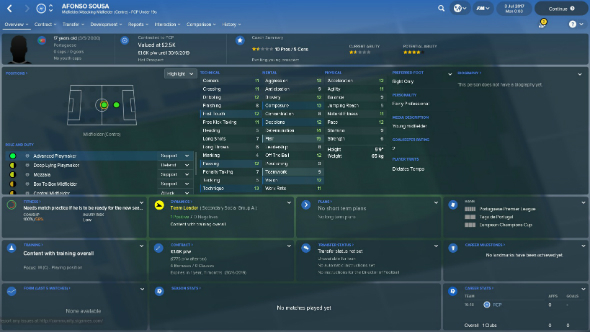 If you are looking for Football Manager 2018 bargains with promise for the future then Afonso Sousa is a great option. 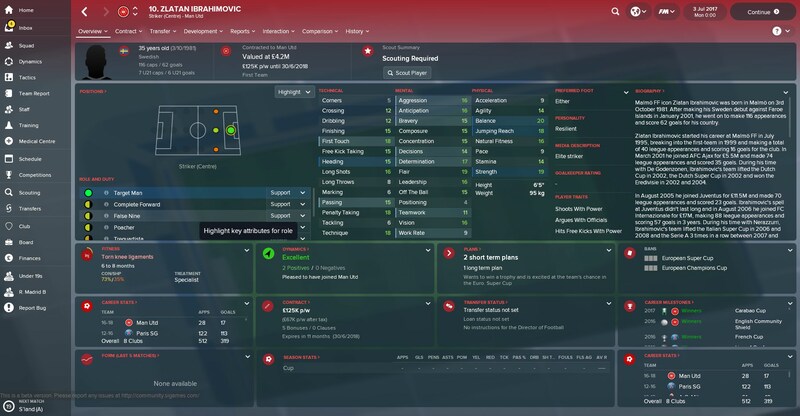 At 17, he will not likely feature in your first team every week, but it pays to play him semi-regularly for the sake of his own development. For certain, play him in cup matches, take him on pre-season tours, and bring him on in matches that are already won. 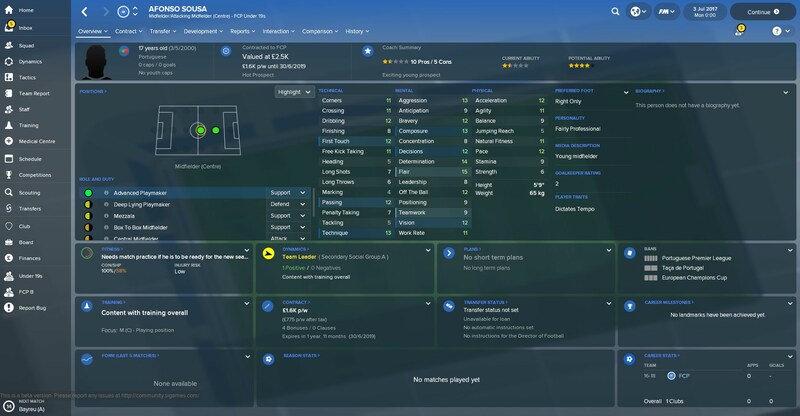 After a couple of seasons Sousa begins to fulfil his potential and repay any confidence shown in him. The kind of quality he is capable of producing makes his price tag look minimal. Admittedly, Denis Cheryshev has failed to develop beyond the impressive performances he recorded for Real Madrid B when he was younger, but he is still a capable wide player for a mid-table, top division team. 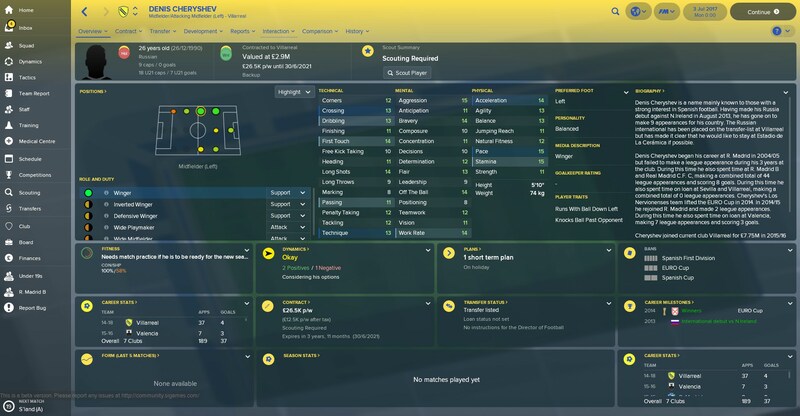 Cheryshev is a cheap player with decent stats all-round, allowing him the right skillset to run up and down the line without issue for the full 90 minutes. A significant downside to his game is a lack of adaptability when it comes to his role, though, as he is all but incapable of performing as anything other than a traditional winger. 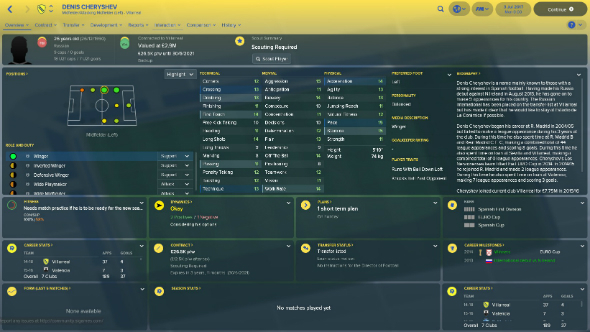 If you look outside of the usual Portuguese clubs like FC Porto and Benfica then it is possible to get your hands on some of the cheapest Football Manager 2018 bargains. 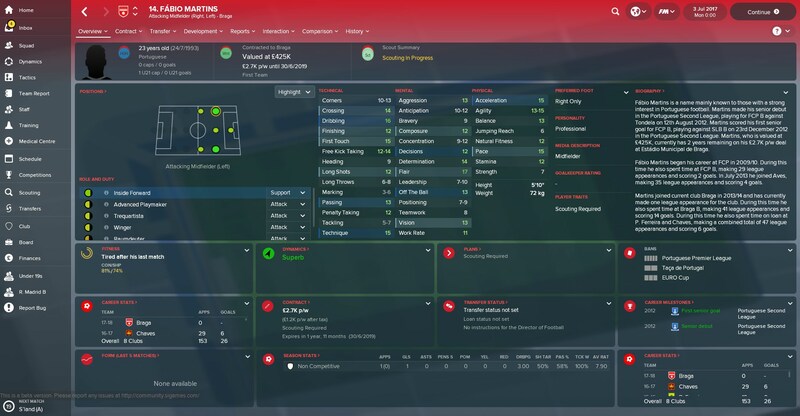 Fabio Martins is a good example of this, the attacking midfielder possessing both technical and physical stats that far outweigh his asking price. The fact that he is just 23 years old means he has some resale value should you want to part ways with him while his contract is still live. 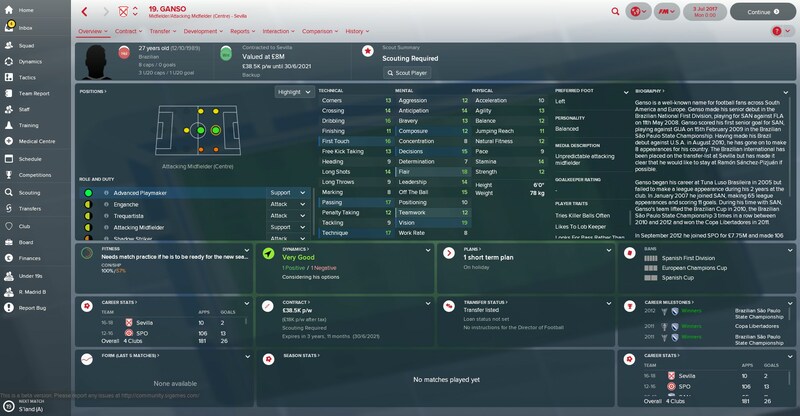 The Swedish juggernaut might be 35 years old, but his ability level is so high that it is impossible to count him out until he decides to retire. With 18 and above for first touch, technique, flair, balance, strength, and jumping reach, Ibrahimovic remains one of the game’s most lethal strikers if you can get him the ball in the box. 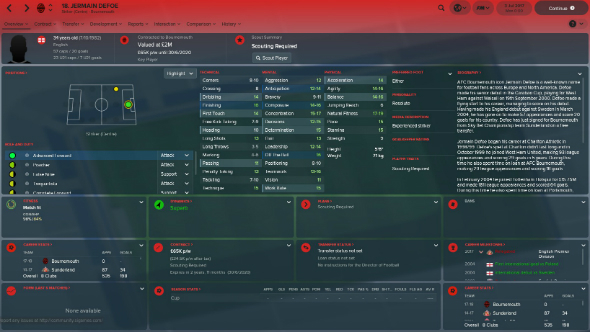 He can be yours for well below £10 million, making him a steal even if you only manage to get a season or two from him. Despite his increasing years, Jermain Defoe has managed to retain much of the speed and directness that has seen him rack up nearly 200 senior team goals. Whilst he can no longer cut it as a primary option for the very best teams, he still packs enough quality to lead the line for a team at the bottom end of the top tier, or to warm the bench for someone higher up. 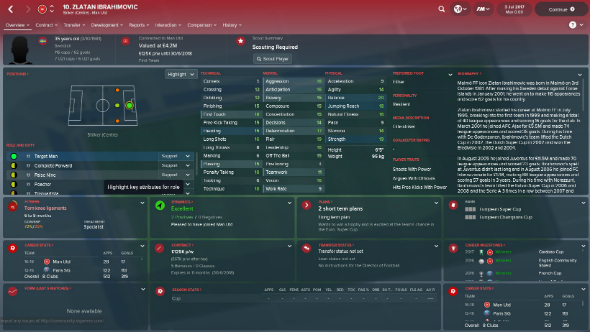 Make the most of his quality finishing and high work rate in short bursts and he will repay you with a respectable haul of goals. His £6-8 million fee is pretty appealing considering he is the seventh-highest goalscorer in Premier League history. 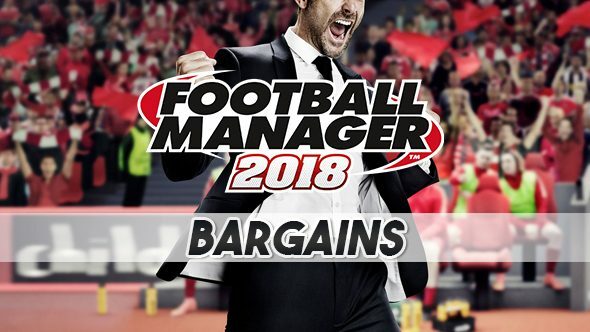 Those are our picks for the best Football Manager 2018 bargains. 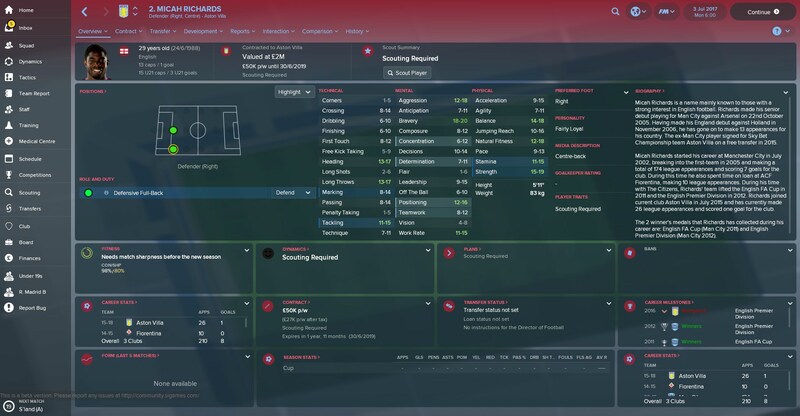 Discovered any favourite players on the cheap? Let us know in the comments below.